This week’s progress was a surprise. I lost what I’d gained last week due to water retention, and then a little extra. I will note that I am still retaining water (stupid hormones; it’ll stop this week thank goodness), as my ankles are a little puffy and parts of me are still swollen. As I move forward through my 8th month of post-op life into my 9th, I’ve decided it’s time to tweak things again to make this tool work to my advantage. 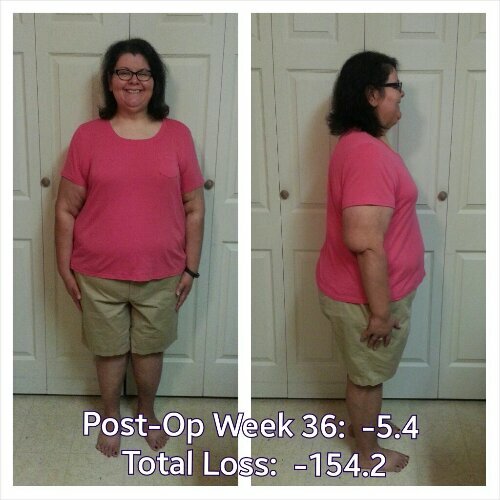 I have 73 pounds left to lose to get to my goal and 23 to get to my surgeon’s goal. I am going to try increasing my calorie intake to 1000 calories a day minimum, and pushing it to 1200 on the days I work out. Eating 800-900 calories daily isn’t cutting it, and I find that on these days I get really, really hungry–counterproductive for me, given that the surgery I had is supposed to suppress hunger! 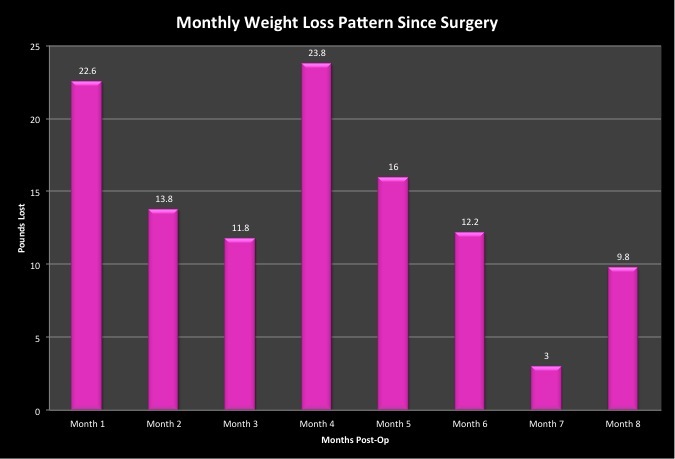 Hunger does NOT completely go away for everyone who has the sleeve surgery. It is greatly minimized, but it did NOT vanish in its entirety for me. There are days that I still get ravenously hungry, which is scary to me, because my hunger before I had surgery was insane. But my hunger levels are nowhere near where they once were. I have learned to listen to my body’s cues for eating, though, and my body is telling me that the calorie level I’m subsisting on is simply not enough. So I’m cranking it up a little bit. I am also concerned that this prolonged period (nearly 9 months) of very low calorie intake is going to jack with my metabolism and do permanent damage, so I’m hoping that this increase in calories will stave that off and promote continued weight loss, especially as I become more active closer to the summertime. As summer approaches and school winds down, I am planning to work in more exercise as I have more free time in my schedule. I know I need to add strength training in, but I’m unsure as to how to go about doing it. Tomorrow, I have a fitness assessment with a personal trainer which I am really excited about! I am looking forward to seeing what she is able to tell me about what my fitness level at present is. I’m not expecting great things, but I do inhabit a body that has been overweight for nearly 40 years. It has moved more in the past 4 months than it ever has. I know it will take time to get into good enough shape to play sports and run on a regular basis. I’m just hoping that Kori (the trainer) can help guide me in the right direction as far as what I should be doing to tone up and build muscle. That’s where I need the most help. Today was also measurements day. I’m down a total of 95.25 inches all over since last June, when I started taking measurements of 13 places on my body. This is nothing short of mind-blowing. I mean…that’s nearly 8 feet. 8 feet of me GONE. I find it hard to believe when I think about it, but then when I see myself in the mirror without my clothes, I am reminded that indeed, 8 feet of me is gone, but the skin that contained that diameter remains behind. I have a post stashed in my head for how I feel about that but I will save it for another time. I am finally starting to notice my tummy flattening out…this is a big deal to me as my tummy has always been big and round, and now…not so much any more! But as my belly flattens out, other parts of me are starting to look deflated and stretched out, which I am less than pleased about but not surprised by. I knew this would happen; I didn’t realize it would be quite as drastic as it has been. In 2 weeks, I will do the Firefly Run (my first 5K) which I am also excited about. Since the weather is supposed to be nice this week and I am finally off, I’m planning on heading to one of the parks that borders a wildlife preserve in town and running around the pond there just to see if I can get road ready. The treadmill is okay, but outside in the sun is better! Besides, the vitamin D I will make by soaking up the sunshine will be good for me too, and just getting to spend time outside after this bitterly cold and gray winter will be good too. I need to be outside. I can’t wait for warmer weather to get here so I can take walks and runs outside after school since now it’s getting dark later in the evening. I’m a data hound, what can I say? I LOVE DATA. So here’s what my loss patterns have looked like for the past 8 months. I am hopeful that with the addition of strength training, next month’s loss will be more than the 9.8 pounds this past month was. We’ll see how the calorie tweak affects my progress. I’m also planning on adding in more magnesium, as my multivitamin doesn’t provide me with 100% of what I’m supposed to have. I want to make sure my electrolytes are in balance, and I know this is one I’m not getting enough of. I changed calcium supplements this month because I wasn’t remembering to take them. This jacked up my calories each day (by 30) but I am not concerned about that. I was more concerned that I wasn’t remembering to take my calcium! So this week, I’m going to increase my exercise by one workout more a week, and bump up my calories while keeping the proportion of my macronutrients the same. We’ll see how this adjustment goes, and adjust from there if it is needed. I am a constant experiment, and as always, a work in progress. Eating the past two days has been okay. I have determined that weekends are pretty much dining out days, and I try to make good choices on those days but it’s tough. I do try to make sure I am active on those days to accommodate for any less than ideal choices I make, and I definitely make sure I get in my water. Yesterday, I met my goal of eating seafood at least 3-4 times weekly by having salmon Oscar (one of my new favorite things! ), and made sure I exercised at night. 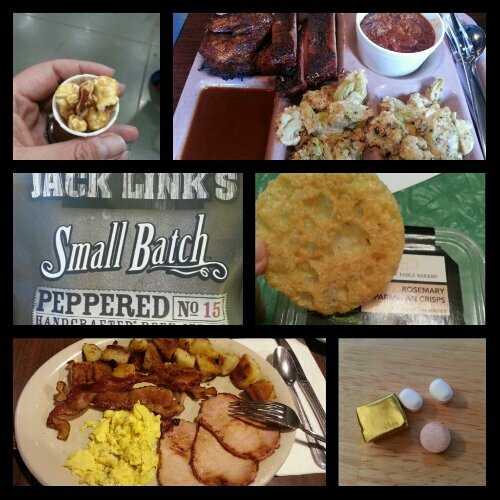 I got in 1066 calories, 90 grams protein, 75 grams carbs, and 42 grams of fat. I ate some fried foods…like I always say, I’m not perfect, and I don’t do it every single day so I don’t feel bad about it. Saturday’s food choices, from upper right: Rudy’s smoked turkey, pinto beans and barbecue sauce; salmon Oscar (grilled salmon with crabmeat in lemon butter sauce), steamed veggies, fried asparagus spears; grilled chicken tenderloins, baby carrots, fried okra; mixed green salad with shredded cheese and 3 croutons; multivitamin and calcium supplements x2, iron supplement; sample of Trader Joe’s macaroni and cheese with corned beef. Not shown: part of a cornbread muffin. Today I did okay too, getting in 905 calories, 88 grams protein, 60 grams carbs, and 45 grams of fat. I didn’t want to eat any more after I’d eaten my last food of the day to try and get to 1000 calories, so I simply chose not to. There is always tomorrow to aim for that goal. I did a work out with Wii Active Workouts and chose to do the step aerobics, sparring and squash workouts so I was pretty active for 45 minutes. I will have to keep that around for days when I don’t feel like leaving the house to work out, or when it is raining out and I want to get moving. 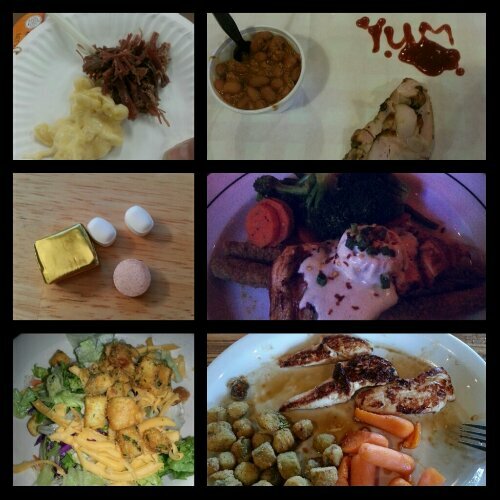 Today’s food choices, from upper right: part of a smoked chicken breast, a pork rib, brussels sprouts and cauliflower gratin, a bite of brisket chili; rosemary parmesan crisps; multivitamin and calcium supplements x2, iron supplement; scrambled egg, Canadian bacon and bacon strips, a few home fries; Jack Link’s peppered beef jerky; sample of pecan caramel popcorn. Not shown: a piece of whole wheat toast and a bite of cornbread. This entry was posted in challenges, choices, daily bites, eating, exercise, goals, head trips, la guerra, oh behave!, post-op, progreso, reflections, self-image, success, the sleeve, vsg, weight loss surgery and tagged aspiring runner, challenges, daily bites, eating, exercise, fitness, goals, I am NOT perfect, I work out, measurements, NSV's, omg I eat carbs!, planning for success, post-op eating, post-op life, progreso, progress report, self-image, she's got skillz, sleeve gastrectomy, sorry for sleeve rocking, stupid hormones, success, the body is a funny thing, the little things, things of win and awesome, VSG, vsg realness, werk!, WLS, work in progress, workin' on my fitness. Bookmark the permalink. I think you’re right to pick up the calories a bit. This is my theory – and I’m no expert so it shows the value of the theory which probably isn’t much but here it is anyway – I think that part of what makes it work so well for awhile is that our bodies can shift to getting energy off of our fat stores, but it’s like your body now is saying oh crap, we’re running out of storage, we gotta be careful not to use it all up, thus the hunger sets in. I’ve seen this with a few people that they get to this point and hunger really sets in. Hope it goes well with the trainer. I’ve got a friend who works quite a bit as a trainer with people who’ve had WLS. He’s based out of Denver but he works remotely with people from around the country – I can give you his contact information if you want.